The lessons we learn both in the classroom and about ourselves are arguably the greatest value of a graduate education, but they aren’t effective if we don’t take the time to process and internalize them. Yet, when can you consciously reflect upon, process, and reshape your goals during graduate school? How can you make sure the lessons you learn throughout the year aren’t shuffled aside in the hurry to move on to the next step? These are the questions we asked ourselves as first year Wharton MBA students. 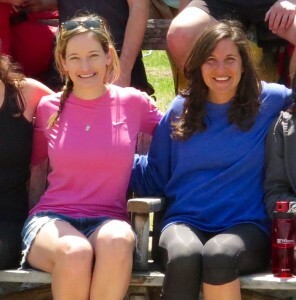 We had met at the beginning of school and bonded over our mutual love for teaching yoga. Months later, we discussed how much (or maybe just how little) had changed for us during school—whether our goals had shifted, what disappointments we had encountered, what personal discoveries we had made along the way. We felt it was important to set aside time at the end of the year to actively contemplate these things, and we wanted to share this experience with others. And thus the idea for the LeadUp was born! Read our recent article in the Wharton Journal to learn more about our origins. LeadUp provides immersive experiences for young leaders to reflect on their values, align their goals with their actions, and develop holistic leadership skills through positive psychology and mindfulness training. LeadUp is designed for Millennials by Millennials to help you succeed in all aspects of your life. We know the pressures of student life and can help you reflect and reconnect so you can achieve your highest potential – whatever that means to you. You will have a chance to refine your definition of success and develop the skills to help you get there. That is why we have designed LeadUp for you. You are encouraged to maximize your time by designing your own schedule. Interested in getting active and challenging yourself in the outdoors? Awesome. Curious to learn how to meditate and practice yoga? We’ve got you covered. Want to take a break and nap all afternoon? Great. Looking to meet other amazing young professionals? We only bring the best! Reflecting on the past year: What are you most proud of? What did you do well? Which areas would you like to improve upon? Focusing on the present: Which motivations or desires drive your actions? When do you feel happiest or most fulfilled? How can you align your goals and actions to achieve deeper satisfaction? Can this be incorporated into your future career path, and if not, how can they be integrated into your daily routine? Looking to the future: What does “success” mean to you? What do you consider your biggest failures, and why? What do you consider your best accomplishments, and why? How can you use those insights to equip yourself for a life of excellence?